Bill and Sue Ellen Stouffer planted the first 250 chestnut trees on Cedar Hill Farms in the spring of 2009. Additional trees have been added, bringing the total count to 1400 chestnut trees, encompassing 20 acres of rolling central Missouri hillside. That’s over 5 miles of chestnut trees! 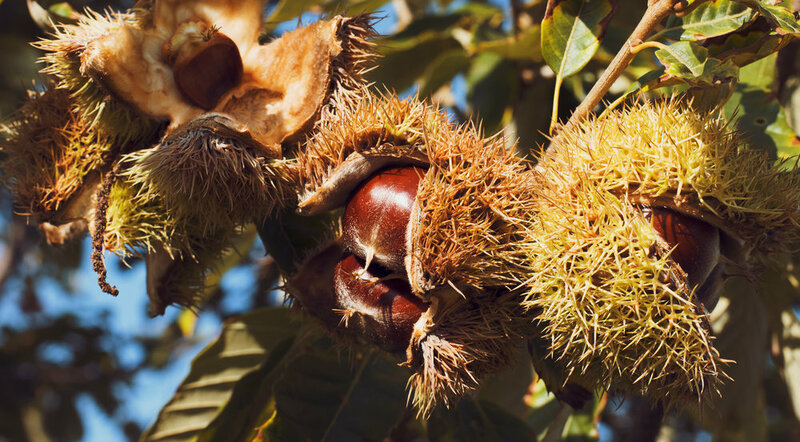 As of the fall of 2017, 400 trees are producing a significant chestnut yield and more is on the way as the younger trees mature into full production. The Stouffers worked closely with the University of Missouri Center for Agroforestry in establishing their orchard. They planted Castanea mollissima or Chinese chestnut trees which, while native to China, thrive in central Missouri, tolerating the high summer heat and humidity typical of this part of the country. These trees are resistant to the chestnut blight that devastated the native American chestnut species, and produce a large, sweet tasting chestnut. Specific varietals grown in the orchard include Qing, Peach, Gideon, Khor and Sleeping Giant. Bill and Sue Ellen Stouffer are high school sweethearts that married and spent their adult lives farming together. At its peak of production, their farming operation in Saline County, Missouri included 2500 acres of annual corn and soybean row crop production and a 200-cow beef herd. In 2009 they retired from large-scale commodity farming to lead a simpler life, growing specialty crops of chestnuts and elderberries on their 130-acre Cedar Hill Farms homestead. They are thankful for this season of their lives and gratified to share the bounty of their labor and land with you. The history of the farm began when the Adkisson family was granted a parcel of land in Saline County, Missouri upon relocation from the Missouri bootheel due to the destruction caused by the New Madrid earthquakes of 1811-1812. The family claimed their new home as a producing farm, growing everything from livestock to hemp and row crops of corn and wheat. John Tillman Stouffer journeyed from Kentucky, landing at the Missouri River port of Arrow Rock with the intention of settling in central Missouri. He met and married Elizabeth Jane Adkisson in 1858. Together they made their home on the parcel of land known today as Cedar Hill Farms. Cedar Hill Farms has been owned by descendants of the Adkisson/Stouffer union since then, except for seven years during the Great Depression when Dr. Bob Stouffer, being paid by chickens, eggs, meat, and produce, lost the farm due to non-payment of debt. Bill and Sue Ellen Stouffer moved to Cedar Hill Farms after his mother, Virginia, passed away in 1989.